The Columbia Police Department started its K-9 Team in 1988. It is now a specialized unit that consists of eleven K-9 teams (one handler and one dog). Each team operates on a city wide basis and is used to support patrol operations, specialize units, and criminal investigations division, 24 hours a day, seven days a week. The K-9 Team currently utilizes Belgian Malinois and Dutch Shepherds. The canines are trained in multiple skill sets to include tracking, drug detection, criminal apprehension, handler protection, building search and article search. 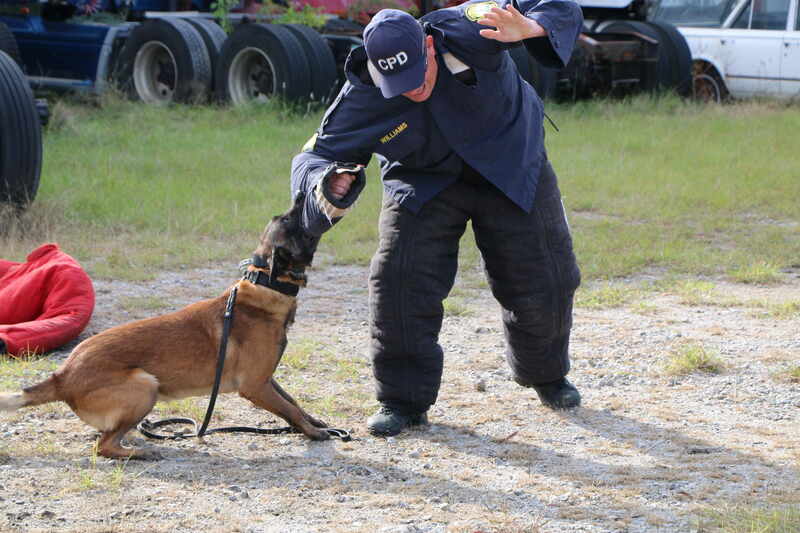 The canines go through many hours of training with their handler to maintain the highest level of proficiency. Over the years the K-9 teams have tracked and located missing persons, apprehended dangerous suspects, and have been responsible for the removal of significant amounts of illegal drugs from the communities in Columbia. The handler attends many physical hours of training throughout their career with their canine. The partnership between the canine and their handler is one of the most unique in the police force because at the end of each shift the canine actually goes home with the handler and becomes part of the family. Master Police Officer E. Walker acts as a decoy during a canine training exercise.